In August of 1945, the United States dropped two atomic bombs on the Japanese cities of Hiroshima and Nagasaki. These bombs were intended to cause Japan to surrender to the allied forces and to bring about the end of WWII. As a result of direct exposure to these bombs, over 200,000 people died. Even more have had severe health problems or died due to the residual radiation from the bombs. Many of the survivors of the atomic bombings of Hiroshima and Nagasaki are still afflicted with bomb related illnesses today. At the onset of the second world war, Japan had a policy of neutrality. Then in September of 1940, they signed the Tripartite Pact that allied them with Germany and Italy. As a result of Japan’s decision to ally itself with Germany, the United States cut off the country’s supply of oil. Japan countered with a surprise attack on Pearl Harbor on December 7, 1941. After this attack, the United States and Japan were officially at war. The initial stages of the war progressed nicely for Japan. By 1942, Japan controlled the Philippines, Burma, Malaya, and the East Indies. Unfortunately for Japan, its luck did not hold out. The country suffered a defeat at the battle of Midway in 1942. Three difficult years later, the allies demanded unconditional surrender from Japan. The Japanese people refused, mainly because they were unaware of how precarious their situation really was. They also were unsure of the future of their Emperor should they surrender. Since Japan would not surrender unconditionally, according to the United State’s demands, the US decided to force Japan to surrender. At precisely 8:15 a.m. August 6, 1945, the first atomic bomb to be used in actual warfare was dropped upon the city of Hiroshima. This bomb, which took the city completely by surprise, had an energy yield of approximately 15 kilotons of TNT. Almost immediately after the bomb went off, an enormous fireball formed, measuring 28 meters in diameter and with a temperature of 300,000 degrees Celsius. Intense heat rays and radiation were released in all directions at the moment of the explosion. 15 % of the energy released from the bomb was turned into radioactive rays (5% initial radiation and 10% residual radiation). 35% of the energy was released as heat waves and 50% of his energy went into the power of the blast. Hiroshima was chosen as a target for the atomic bombing because up until this point in the war, it had not been heavily bombed. Those directly affected by the A-bomb in Hiroshima were 320,000 civilians and 40,000 soldiers. By December of 1945, 140,000 of these people were dead, including 20,000 soldiers. Within two weeks, 90% of these deaths had occurred. Thirteen square kilometers of the city were almost instantly transformed into A-bomb ruins. Of the 76,000 buildings in Hiroshima, 92% were destroyed by the blast of the bomb. Three days later, at 11:02 a.m., August 9, the second atomic bomb ever used was exploded over the city of Nagasaki. This bomb had an energy yield of approximately 22 kilotons of TNT. The fireball caused by the explosion was 280 meters in diameter and the surface temperature was about 5,000 degrees Celsius. Of the 280,000 people directly exposed to the Nagasaki bomb, 70,000 were dead by the end of 1945. Different types of bombs were used on the two cities. The bomb used on Hiroshima, a uranium bomb, was nicknamed “Little Boy.” It measured 120 inches in length, 28 inches in diameter, and weighed 9,000 pounds. The Nagasaki bomb, nicknamed “Fat Man,” was a plutonium bomb. It measured 120 inches in length, 60 inches in diameter, and weighed 10,000 pounds. The two bombs achieved little of the destructive capacity for which they were capable. Less than one kilogram of the uranium in the Hiroshima bomb achieved fission and only slightly more than one kilogram of the plutonium in the Nagasaki bomb achieved fission. For both Hiroshima and Nagasaki, the effects of the atomic bomb on buildings and vegetation were devastating, however the effects on the people who were exposed to the bombs were much more tragic and longer lasting. In the years following the bombings, many survivors wrote poetry or drew pictures to try to express exactly what they had been through. Under our fallen house my sister cried pitifully. The beam would not move at all. I noticed someone running towards us. She seemed naked and all purple colored. “Mama!” Now I felt free from danger. But the beam would not budge. He too went away looking so sorry. Flames flared up from the ruined house. Mama’s face went ashy pale. And sister’s small eyes looked up. Mama’s eyes followed the beam. She fit her shoulder beneath it. She pushed it up with all her might. Never to get up again. When the bomb went off. From the awful open wound. And that evening she drew her final breath. 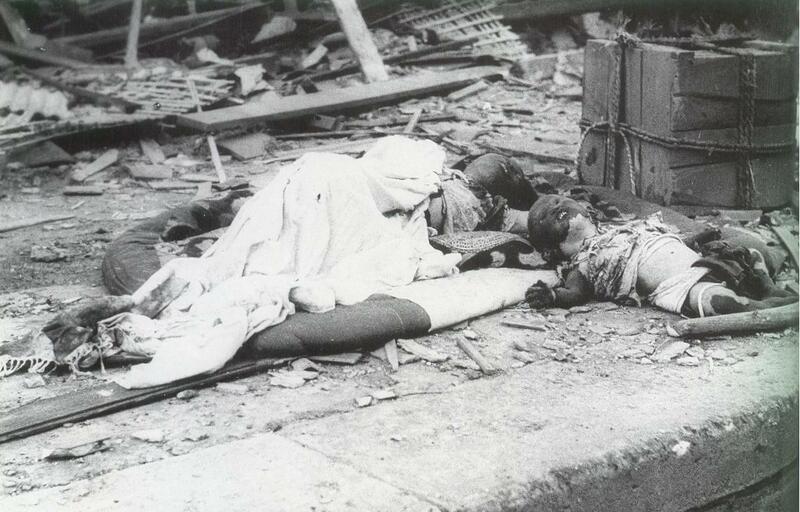 The physical harm caused by the atomic bombs consisted of burns from the heat rays and the fires that spread throughout the cities following the bombings. The blast caused broken bones and lacerations, and the radiation released from the bomb caused damage to skin and to internal organs. Many people’s injuries took an extended amount of time to heal because the high levels of radiation complicated burns and external injuries, slowing the healing process. A variety of ailments began to arise after the bombing and have since been attributed to exposure to radiation. Two different types of burns resulted from the atomic bombings. Primary burns were from direct exposure to the heat rays of the bombs, while secondary burns were burns received from the fired that resulted from the heat rays. Thousands of people, who were inside buildings at the time of the explosion, were trapped under the debris of the fallen buildings. Like burns, two different categories of blast injuries can be identified as resulting from the atomic bombings. Primary blast injuries were caused by the blast itself while collapsing buildings caused secondary blast injuries. Burns and blast injuries were not the only ailments facing the bomb survivors; many also suffered from acute radiation damage. The group of symptoms and ailments that started immediately following the bombing and disappeared within five months came to be known as acute radiation damage. Acute radiation effects include digestive tract disorders, nervous disorders, fatigue, bleeding, infection, blood disorders, and reproductive disorders. Acute effects typically began with nausea and vomiting, extreme fatigue, fever, and diarrhea. Next victims began to lose their hair. Finally, many of the survivors suffered from bleeding and blood disorders. Aftereffects such as Leukemia and Cancer appeared in large numbers of seemingly healthy A-bomb survivors long after the effects of acute radiation had subsided. One physical ailment unique to atomic bomb victims is the development of Keloid scars. Keloids are mounds of raised and twisted flesh that formed over apparently healed burns. Doctors and scientists think that they are related to the effects of radiation, but there is still a lot that is unknown about these scars. What is known is that they are quite painful and even after being surgically removed, and they have a tendency to grow back. Physical ailments were not the only obstacles facing the people of Hiroshima and Nagasaki after the atomic bombings. In addition to killing and wounding hundreds of thousands of people, the bombs also destroyed two entire cities. The bombs wiped out all businesses, factories, stores, schools, hospitals, fire stations, and city government buildings. Survivors lost family, friends, and entire neighborhoods and communities. In the years following the atomic bombings, up until today, the effects of radiation continue to be discovered and studied. The bombings of Hiroshima and Nagasaki achieved their objectives because they resulted in Japan’s unconditional surrender. More importantly, the bombings of Hiroshima and Nagasaki ushered in the age of nuclear weapons. 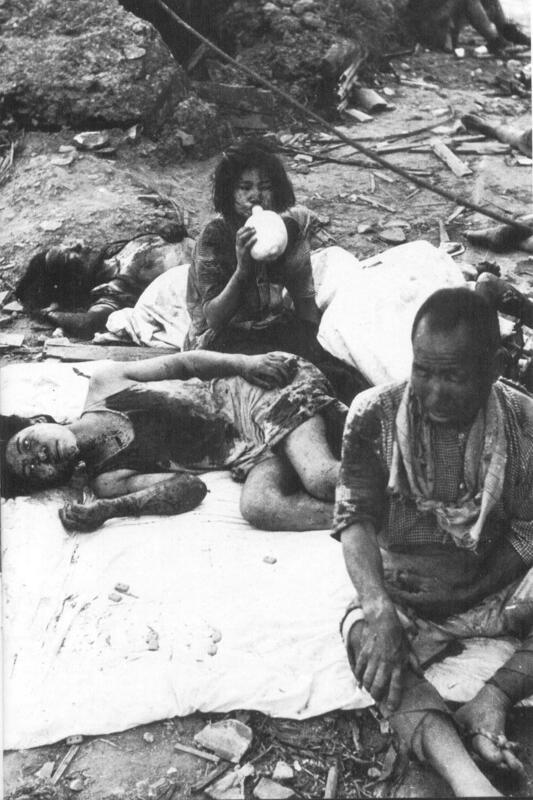 The horrors which people suffered as victims of the A-bomb convinced survivors that the world must get rid of all nuclear weapons. Hiroshima tried to symbolize this, and to pay tribute to all those who died in the bombing, by building a Peace Park. Both Hiroshima and Nagasaki residents, as well as the local governments, regularly petition world leaders to disarm all nuclear weapons so that the tragedies that these two cities, and all of their inhabitants, faced, will never be repeated. Records of the Nagasaki Atomic Bombing published by the City of Nagasaki (Nagasaki Atomic Bomb Museum), March 1996.